It is a matter of taste which activity one wants to call "minigolf" rather than "golf", but probably the best candidate as the "first minigolf course in the world" is the Ladies' Putting Club of St. Andrews in Scotland, which was founded in 1867, and still today is operating and open for public. This 18-hole course of putting greens, called "the Himalayas", was founded by some members of the notable Royal & Ancient Golf Club in St. Andrews. Women had become interested in golf game, but the conservative social norms of the era deemed it unacceptable for women to publicly perform such violent movements that a golf swing requires. Therefore an 18-hole course of short putting greens was constructed for women – apparently the first "miniature golf course" in the world. A few decades later it became customary for many American and British hotels to offer their guests a miniature-sized golf course, using the same designs as actual golf courses, but at one tenth the scale. The game was played with a golf putter and a short driver, and was called "garden golf", "pitch and putt golf", "clock golf" or "par 3 golf". Geometrically-shaped minigolf courses made of fake materials began to emerge during the early 20th century. The earliest documented mention of such a course is in the 8 June 1912 edition of The Illustrated London News, which introduces a minigolf course called Gofstacle. The first standardized minigolf courses to enter commercial mass-production were the Thistle Dhu ("This'll Do") course 1916 in Pinehurst, North Carolina, and the 1927 Tom Thumb patent of Garnet Carter from Lookout Mountain, Tennessee. Thomas McCulloch Fairbairn, a golf fanatic, revolutionized the game in 1922 with his formulation of a suitable artificial green—a mixture of cottonseed hulls, sand, oil, and dye. 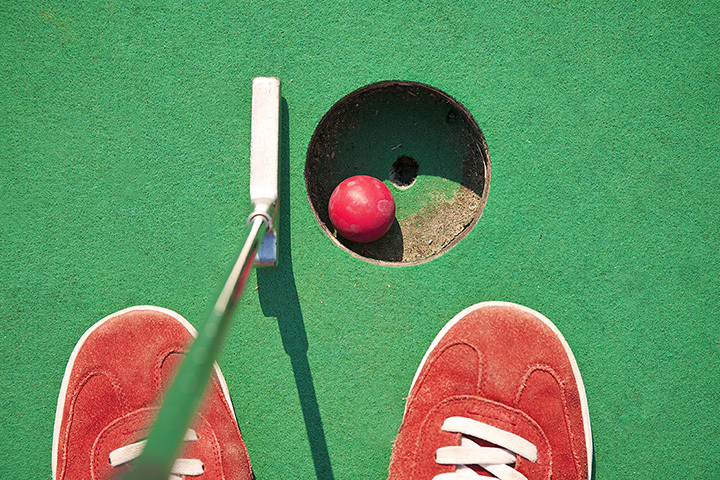 With this discovery, miniature golf became accessible everywhere; by the late 1920s there were over 150 rooftop courses in New York City alone, and tens of thousands across the United States. This American minigolf boom of early 20th century came to an end during the economic depression in the late 1930s. Nearly all minigolf courses in the United States were closed and demolished before the end of 1930s. In 1938 Joseph and Robert Taylor from Binghamton, New York started building and operating their own miniature golf courses. These courses differed from the ones in the late 20s and early 30s; they were no longer just rolls, banks, and curves, with an occasional pipe thrown in. Their courses not only had landscaping, but also obstacles, including windmills, castles, and wishing wells. Impressed by the quality of the courses, many customers asked if the Taylors would build a course for them. By the early 1940s, Joe and Bob formed Taylor Brothers, and were in the business of building miniature golf courses and supplying obstacles to the industry. During both the Korean and Vietnam Wars, many a G.I. played on a Taylor Brothers prefabricated course that the U.S. Military had contracted to be built and shipped overseas.